This morning Ainsley showed us that she has a new skill. We didn't teach her this. Maybe Anne did. I'm not sure but how cute is it! Users don't like change. It doesn't matter how little the change is, if you change something they won't like it at first. If there is a new button out there, the users will push it. They more than likely will have no idea what it will do but the temptation to click it is just too high. Users don't always use the systems we write the way we think they will. If it is programmed to work in a certain order, programmers have to remember that the users won't always follow that. Cosmetics are much more important to the user than the business logic. Even if the logic took 3 months to build, there is an assumption that it will work. By design, computer programmers are not great at aesthetics. We try really hard but we miss the boat quite often. Users assume that if one error message pops up, the whole thing must be crap. Computer programmers love when things are new and exciting. We like to make things work. We get really jazzed about the new enhancements that we do and when we get resistance to them we get disappointed. The software that computer programmers develop can become a sort of "baby" to us. We put our hardest effort into making sure things work and we really love our end results. Criticism hurts. Obviously from the tone of this list, I am the computer programmer. I rolled out a bunch of new changes this week. Things didn't go 100% as planned. It was a rough 2 days. But that was it. It's over. The dust has settled and the users are getting used to the changes. They will become complacent with these changes and go back to being happy. Little do they know, I've moved on to the next set of changes that will come their way! I am competitive. I love to win. This rule applies to everything in my life. I like to win at games, at sports, at tests, at all things. It's just one of the million things that makes me like my Dad. Today I won at something else; the battle of the will. Ainsley is a great sleeper. She may cry for a minute when you put her down but she will stop quickly and go to sleep. Today she decided to try me. She cried for over an hour. Part of the time she would cry softly. Part of the time she would scream. The last 10 minutes of it she screamed. I was determined to not let her win. I probably shouldn't have let her cry that long. It probably bordered on me being a bad parent. But I had to win. I put my feet in the ground and just let her cry. She finally fell asleep an hour later. I won. I am not sure how I feel about my victory. What is the longest you have let your child cry? As I have said, I'm on vacation in the Adirondacks. We are having crazy Adirondack weather. It's sunny one second and raining the next. It was literally just raining on one side of the house and sunny on the other. All that to say, I have nothing better to do than to post pictures on the blog of my sweet baby. Ainsley crawling on the beach in her stars and bars bathing suit that has been worn by all her girl cousins. I am in the Adirondacks on vacation. I am sitting in the quiet of a house that has just been cleared out of children. I am alone. My sisters have left with their children, my father and husband are on the way to the airport with one family, my mother is asleep, and Ainsley is asleep. As I sit here in the quiet, I am prompted to reflect on what this place really means to me. My parents live up her all year round and we make it a point to visit them at least once a year up here. The Adirondack mountains are one of my favorite places to be. I have been coming here for years with my family. I even worked at a camp up here for a summer in high school. It is tucked far away from civilization and the beauty is just incredible. There are mountains and lakes and hills and trees and sandy beaches. It's amazing. But it's not just the views and the physical beauty, it's the beauty of family. My whole family was in the same place at the same time. This happens about once every 2 years or so. Every time this does happen, it's chaotic and crazy. There are 7 children ranging in ages from 8 to 1. Actually, we have all the ages covered in that range except for 5. There is always someone crying or hungry or tired. Someone always needs something. My parents are obsessed with making sure everyone is fed. Everyone has different dietary needs. There are different nap schedules and bed time routines. Someone always has a toy that someone else wants. Throw in a birthday and it's just crazy. Now that the craziness has departed, I am taking the few minutes I have before Ainsley wakes up to reflect on the beauty that this family is. The love runs deep. The cup is full. It is a crazy family, but it's my family. And now I hear the little sounds of a baby waking up. I must go enjoy my day. It has been a year. I can hardly believe it. A year ago, my life changed forever with the birth of the most precious little girl. I have spent this weekend remembering the weekend of labor that I endured last year. As I remember how much work and labor it actually was, I am willing to say that I would do it again in a heart beat to have the end result. 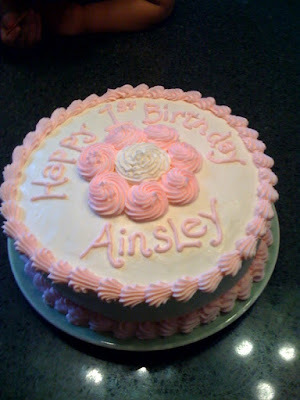 My favorite part of Ainsley's birthday has been the cake. Ryan and I debated about the cake. Obviously, I fell on the side of the argument that we should let her have some. I won. Ainsley got some cake and I have to say the whole thing made me laugh. We sang Happy Birthday with the cake in front of her. As we pulled it away to cut it, she started to cry. She got her piece and she started to squish it in her fingers. She was very interested in the texture. Then she started to eat it. I let her enjoy a few bites and pulled the plate away. She cried again. I wiped her fingers of excess frosting and cake. She cried again. She is definitely more of a Gibbins than a Krumroy. Overall, the day has been wonderful. I am so madly in love with my sweet princess. While I can't believe it's been a year, I can't believe it's only been a year. I can no longer imagine my life without her. It is Wednesday night at 8:15 and we are leaving tomorrow after work for vacation. All I have left to pack is our toiletries and the food for the cooler. I cannot wait. I am so excited to see Nana and Papa and my sisters. All of the cousins will be there too. What a blast. 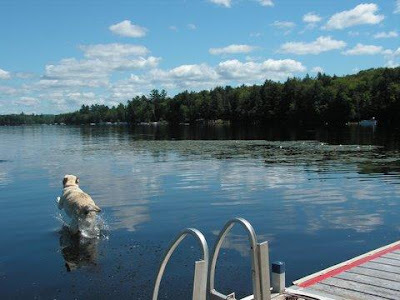 I look forward to telling you all about it but until then, I leave you with this view that I will be looking at for the next week, including the dog!